Chimpanzees are relatively large, tremendously powerful animals that dwell in troops of 30 to 80 individuals. They're thereby relatively safe in their natural African habitat of rainforest and wet savanna. The old, young, sick and weak are vulnerable to some predators, though as can be an individual chimp caught off guard. A number of predators will make a move on a chimp if the opportunity presents in the African wilds. As with most endangered species, chimpanzees can claim mankind as their most threatening predator. Chimps are hunted as part of the "bushmeat trade," which refers to the sale of meat from African or Asian wildlife, especially animals classified as protected or endangered. Bushmeat is a major source of food in rural and urban areas in Africa, but it reaches Europe, Canada and other points around the globe. An estimated 300 or so chimps are killed annually by bushmeat hunters just in the Republic of Congo, according to the Jane Goodall Institute of Canada. Of course, man's widespread destruction of the chimpanzee's natural habitat is another significant factor in declining chimpanzee numbers, even though it isn't exactly predatory behavior by definition. Chimps spend equal time on the ground and in the trees, but they do most of their eating and sleeping up in the branches. They are vulnerable in both locations to one of the African wild's most stealthy and dangerous predators, the African leopard. These jungle cats are the most significant predators of chimpanzees after man. They live almost everywhere in Africa but thrive in the rainforests where chimpanzees are found. They are one of few species large and strong enough to prey on chimps. When a chimp wanders out onto the savanna plains, it becomes vulnerable to lions, too. These cats are fierce hunters, even larger than leopards, and they are capable of preying on chimps. Chimps are vulnerable on the ground and in the trees to attacks by African rock pythons, another significant predator. These pythons are the third-largest snake species in the world, growing 20 to 30 feet long and weighing up to 250 pounds. They share the tropical African savanna as their primary home with chimpanzees. These predators kill by constricting their prey, and they can stretch their jaws to swallow large animals whole, including chimpanzees. Crocodiles also pose a threat to chimps. These reptiles lurk under the water and grab prey in their powerful jaws when one wanders to the water's edge to drink or bathe. Chimps are omnivores with a diet consisting of hundreds of foods, but they aren't a predatory species. Their meals consists mostly of plant-based foods, including fruits, leaves and buds. They do pursue insects, using sticks and other items as tools to procure them from holes. 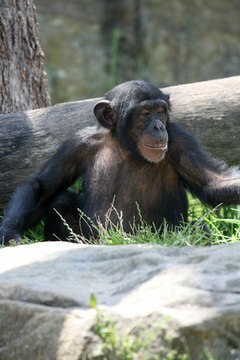 Chimpanzees steal and consume eggs when they encounter them. The meat in their diet comes from scavenged carrion. Chimps are powerful enough to easily kill another animal in defense, but they aren't active hunters. What Is the Predator of a Zebra? Are There Elk in Georgia? What Type of Animal Is an Asian Palm Civet? What Are Some Interesting Things About Jaguars? When Did the Gray Wolf Become Endangered? Is the Tiger a Mammal? Where Is the Ape's Habitat Located? What Kind of Food Does a Chimpanzee Eat? What Does an African Leopard Eat?